Building sustainable water systems involves a suite of stakeholders, including utility department personnel, private industry, finance and legal directors, and the general public. The first IPWA Financial Tools Taskforce Meeting for 2011 will take place on Thursday, Jan. 20. A special presentation will be made by the World Bank on its recently published comprehensive report focused on private operators and rural water supplies. Milwaukee is inextricably linked to water. 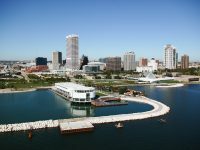 The city lies on the shore of Lake Michigan and near the confluence of the Menomonee, Milwaukee and Kinnickinnic rivers. Wachs Water Services announced that it has formed a new division that will offer assessment services for pipeline systems. The Water Environment Federation (WEF) Board of Trustees announced that Jeff Eger has been named the new Executive Director of federation, a not-for-profit technical and educational organization with 36,000 members representing water quality professionals around the world. The Clean Water America Alliance welcomed Ben Grumbles, a dynamic water policy professional, as its new President in December. Impending growth and multiple key market developments were among high notes providing positive benchmarks for the Plastics Pipe Institute Inc. (PPI) at the trade association?s semi-annual meeting held Oct. 24-27. The City of Aurora, Colo., recently celebrated the completion of the Prairie Waters Project, an innovative and environmentally friendly water system that was finished ahead of schedule and more than $100 million under budget. Johnson County (Kan.) Wastewater (JCW) announced that completion of its Black & Veatch-designed Douglas L. Smith Middle Basin Treatment Plant expansion and upgrade will result in water quality improvements that reach beyond local streams.